Youth Beat leverages community resources to help Oakland kids succeed. At Youth Beat, we believe in the power of partnerships to create greater opportunity for students and effect lasting change in the community. We work closely with Oakland schools and institutions to attract and train low-income students, partner with local and national media outlets to elevate youth voices, and connect with industry partners to provide mentorship and career opportunities for the young media makers in our program. Youth Beat is based at KDOL-TV , the TV station of the Oakland Unified School District. 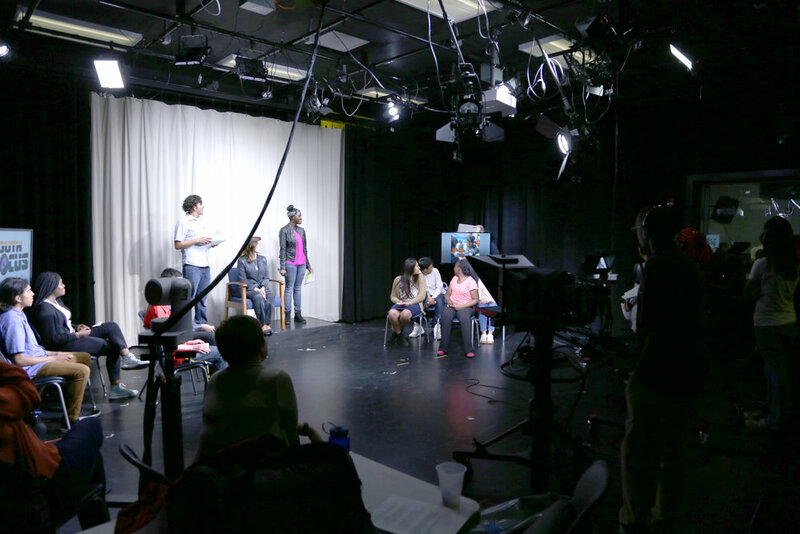 KDOL provides free access to its state of the art studio space, along with in-kind video production gear and tech for all Youth Beat programs. As a PEG (public, education and government) TV channel, KDOL receives hundreds of thousands of dollars each year from local cable providers through the City of Oakland. But there's one catch: these funds can only be used to buy equipment and production gear for the station. Youth Beat makes the link between Oakland students and these community resources. Without Youth Beat's team of professional teaching artists and curriculum, the broadcast studio and its incredible equipment would not be available for student media arts training. Youth Beat works closely with OUSD to offer academic credit for our classes and create quality media arts programs in Oakland public schools. We work with schools across the district to craft high quality media arts programs that engage students, bring technology and expertise into under resourced schools, and provide a huge value add to the school's class offerings. Through an articulation agreement and a staff position in the Laney College media department, Youth Beat offers both articulated and dual enrollment community college courses through Laney that are taught at KDOL-TV and open to any OUSD student. By providing opportunities for students to earn college credits while still in high school, this partnership helps Youth Beat provide a bridge to college for underprivileged students in Oakland, who too often don't follow through on secondary education. Through YB's wrap around services, mentorship and professional training, we help keep kids on track and prepare them for success in college and career.